This exercise is done in the basic floor position with your back flat on the floor, celebrity fitness trainer and instructor Tamilee Webb tells SheKnows. To give your abs a workout, place one end of the band on your ankles and bend your knees up to hip level. Hold the other end of the band in two fist grips with your palms down and anchor it under the buttocks. Then curl your knees in toward your chest and release them back to hip level. Curl in and release, keeping the repetitions smooth, continuous and controlled. 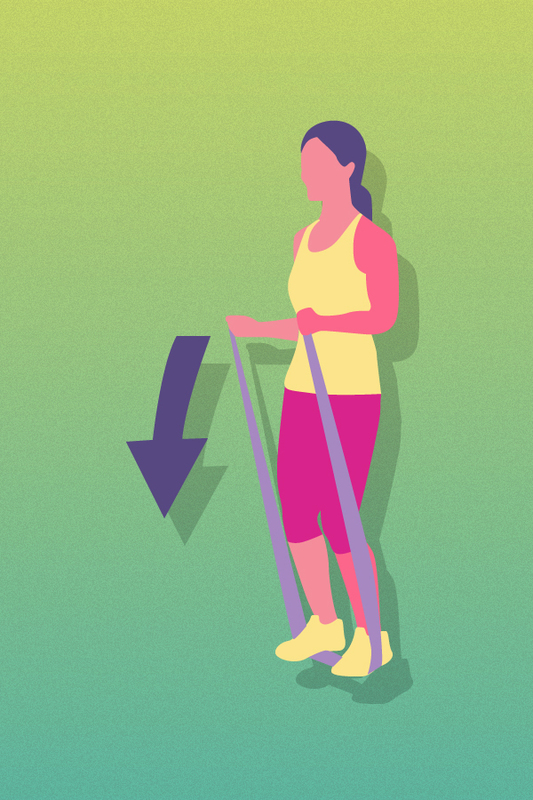 To do this move, loop the band around a stable object (like a pole) and step into the band, placing it above or below your navel, Quianna Camper, RSP Nutrition athlete and certified personal trainer, tells SheKnows. 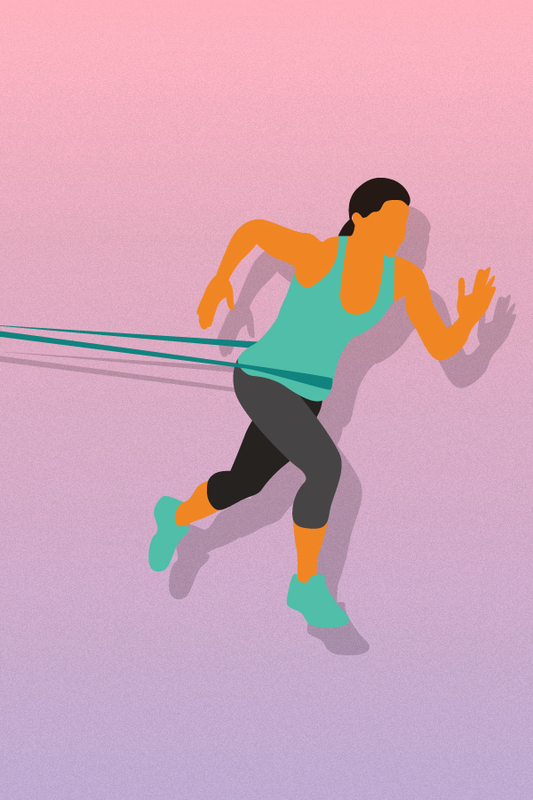 Then sprint for 10 to 20 seconds, allowing the band to resist you, then repeat. Camper also likes this option, which gives your shoulders a workout. 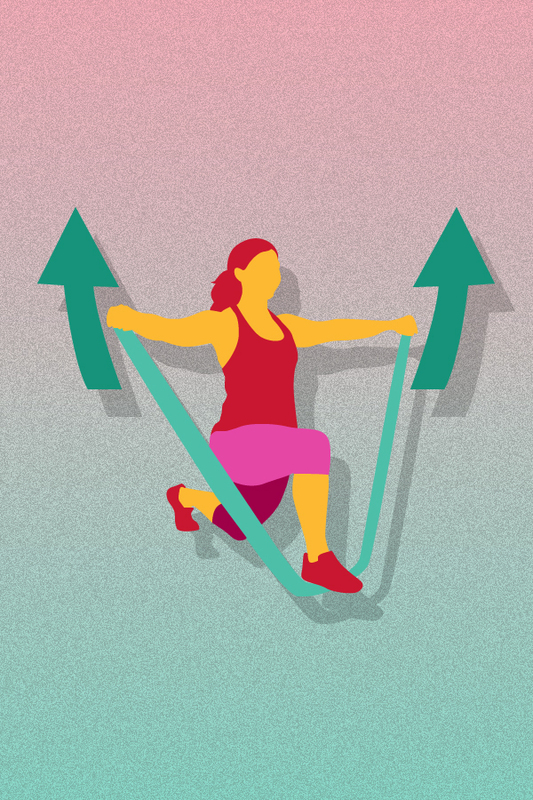 To do it, holding both ends of the band, place the band under one foot, standing in split squat position, then squat. At the top of squat, extend your arms out to your side, performing a shoulder fly, then repeat. Who doesn't like squats? To do this version, Martin says to stand with your legs hip-width apart with your feet pointing forward. Place one long band underneath the soles of your feet, and hold the ends in each hand. 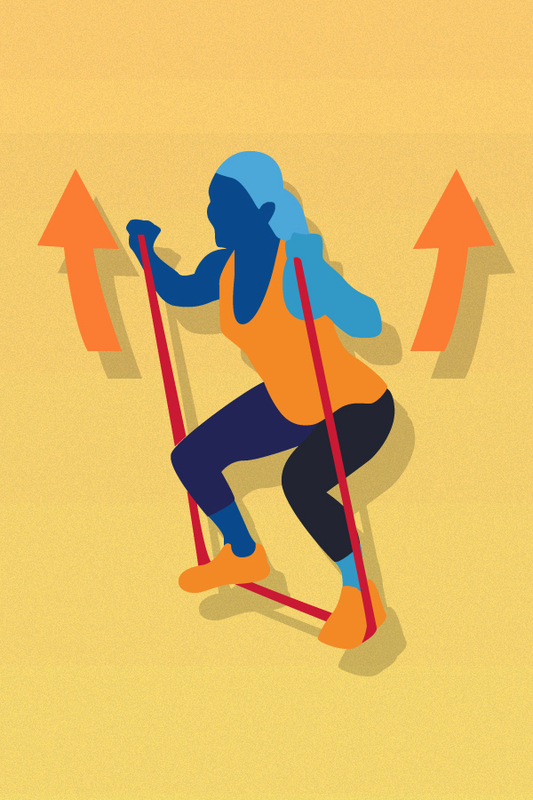 Bend your legs in a squat, then straighten your legs to stand up and feel the resistance. Make sure to use good squat form, meaning keeping a flat back and your chest up. Here's another one from Camper: Loop the band around a stable object, hold both ends of the band, and place your legs into a squat position. 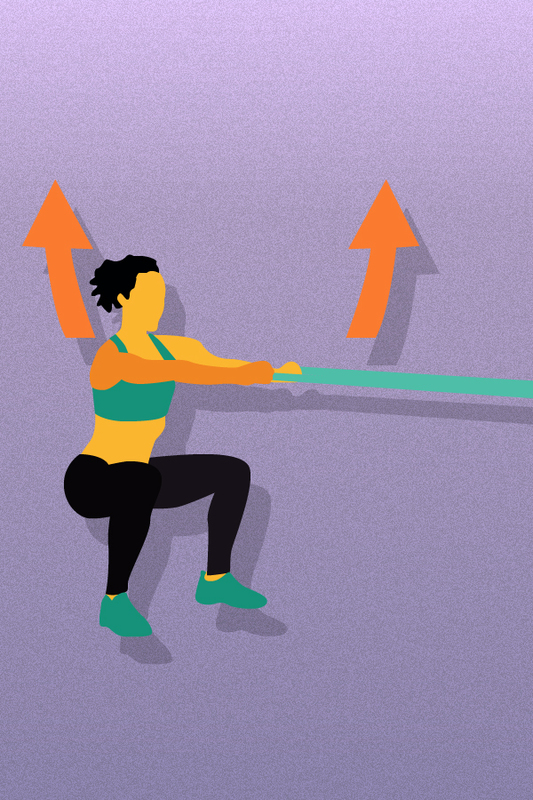 Do the squat, stand up straight and then repeat. 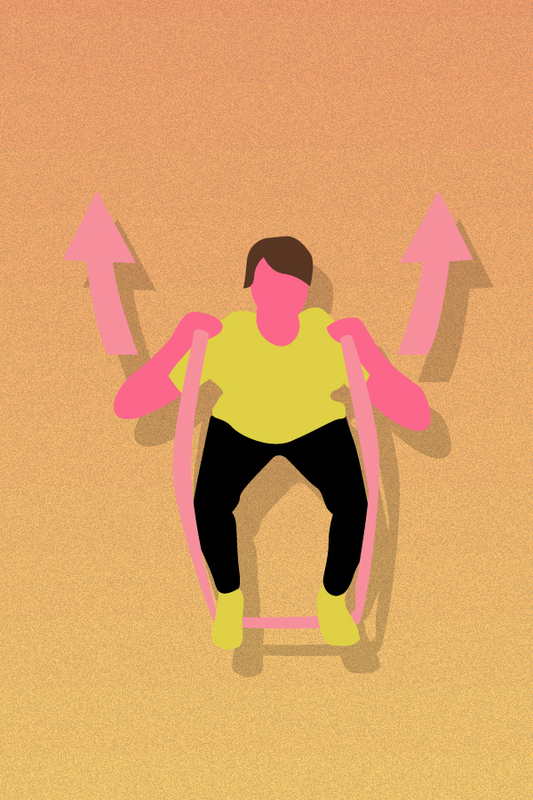 To give your hamstring a workout, get into standing position, holding the back of a chair for support. Webb says to then place the band around your ankles and extend your right leg out in back to create tension in the band. Then flex your foot. Keeping it flexed and your knees together, curl your right leg toward your buttocks. 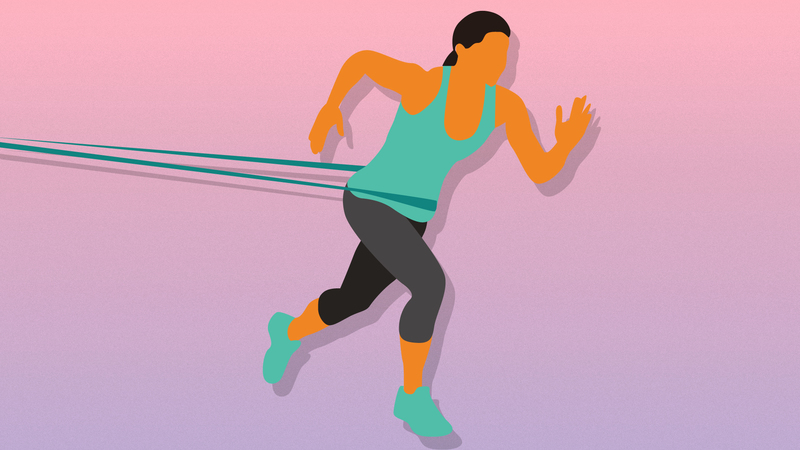 Then release your leg back down, but do not let the band go slack. Curl in and release down, keeping the repetitions smooth. For this stretch, Webb says to start out by lying on your right side. Then bend your left knee so your foot is flat on the floor and behind your right leg. 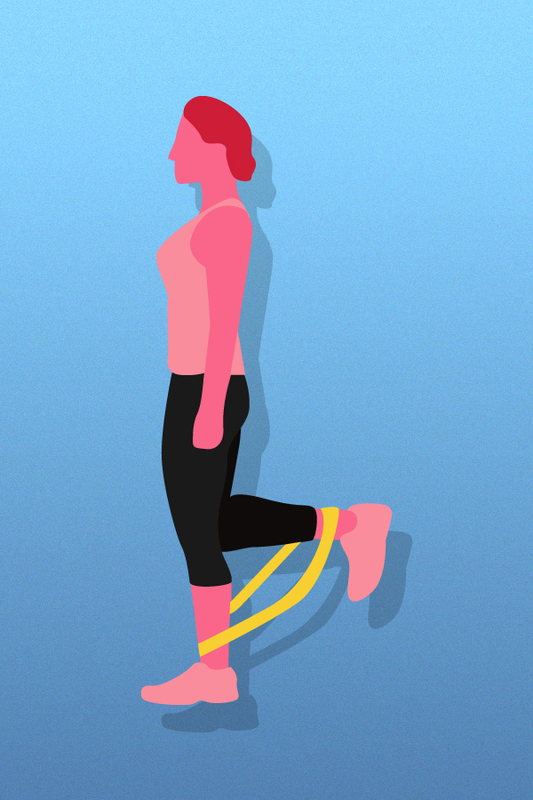 Place one end of the band around the middle of your left foot and the other end of the band around your right calf. 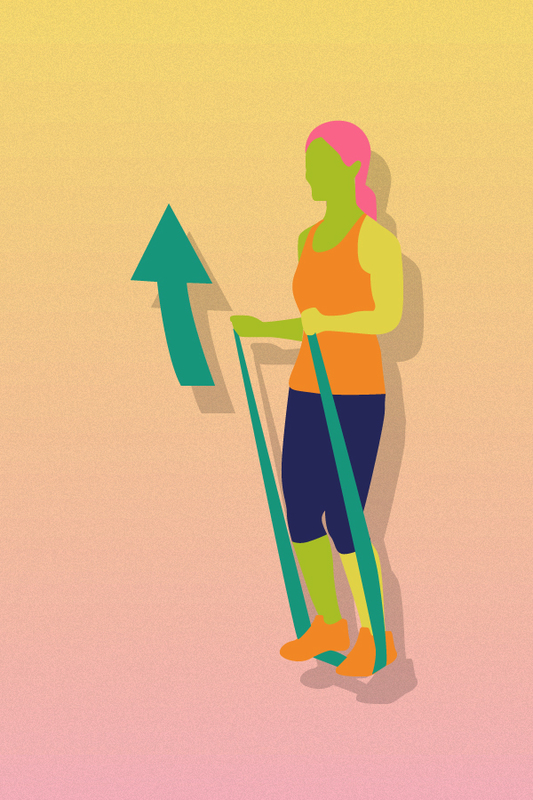 Note that the base leg does not move during the exercise. Slowly lift your right leg up toward the ceiling, keeping your leg straight but not locked and your knees and hips facing forward. Don’t let them roll back. 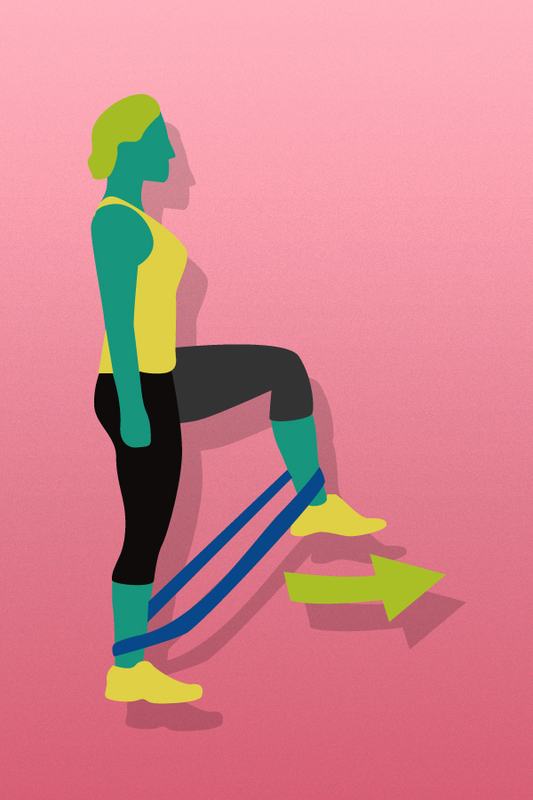 Then lower your leg, keeping the band tensed and your foot flexed throughout. Lift and lower, keeping the repetitions smooth. Here's another one from Webb. It works your upper back, shoulders and arms. To start, hold the band with two fist grips with your palms either in or out and raise your arms above your head. Make sure your elbows are straight but not locked. Keep your left arm elevated. Pull your right fist down to shoulder level and slowly raise it back up to the starting position. Keep your right arm raised. Pull your left fist down to shoulder level and slowly raise it back up to the starting position. Alternate arms as you do the exercise, keeping the repetitions smooth, continuous and controlled. 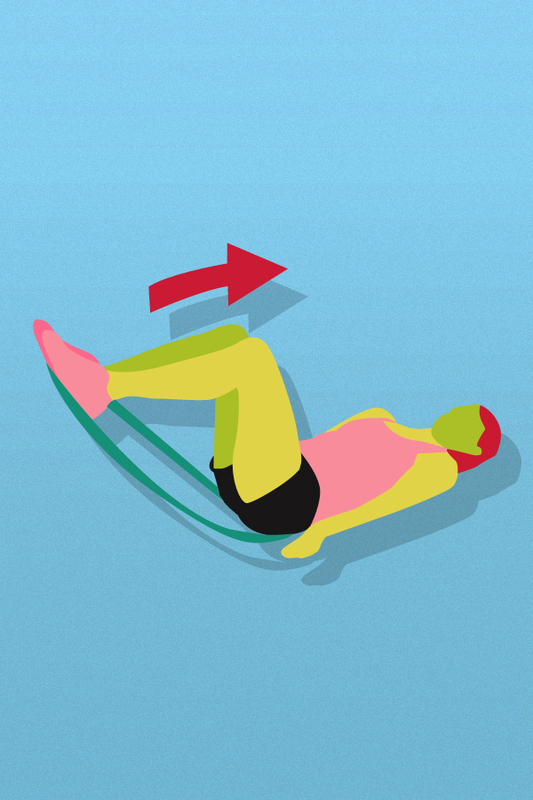 To work your outer thighs, Webb suggests positioning your body lying on one side with the top leg slightly raised and the band placed around both ankles. Keeping your foot relaxed (neither flexed nor pointed but just loose), lift your top leg up toward the ceiling as high as possible. Slowly lower the leg to the point just before the band goes slack. Then continue to lift and lower, keeping the knees and hips facing forward and the repetitions smooth. For this one, Webb says to start by holding the band out in front of your chest in two fist grips with your palms in. Then cross your forearms, keeping your elbows bent and up at shoulder level. Your hands should now be back-to-back with your palms out. With your forearms crossed, slowly press your fists out. Feel your chest muscles work. Release your fists in without allowing slack in the band. Press out and release in, keeping the repetitions smooth, continuous and controlled. To stretch the front of your thigh, Webb says to start in the basic standing position, holding the back of a chair for balance. Then place the band around your ankles and bend your right knee up to hip level. 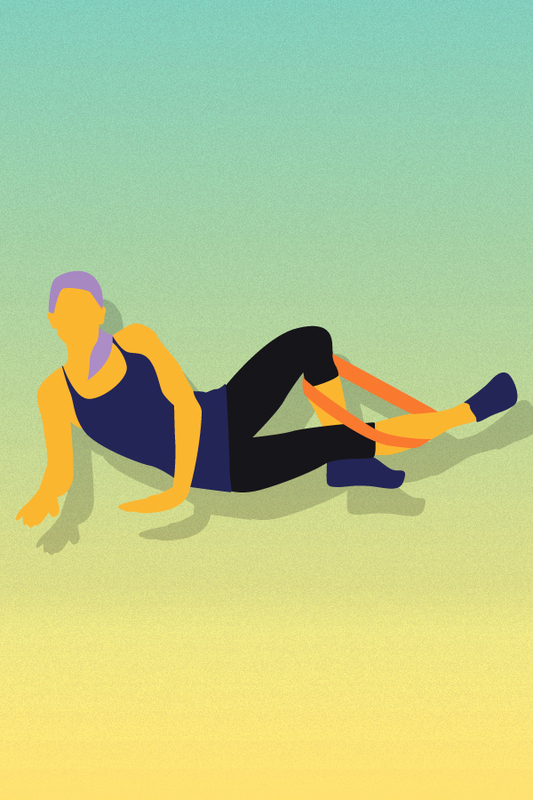 Hold this position throughout the exercise. Slowly extend your right leg forward, keeping your knee up and foot flexed. Moving only your lower leg, release your right leg to the starting position. Extend your leg, then release it. If you want to give your upper back and shoulders some attention, Webb recommends this move, which focuses on the rhomboids and delts. To do it, hold the band in two fist grips with your palms down and raise your arms up to shoulder level. Keep your fists close to your body and your elbows up and out to the sides. 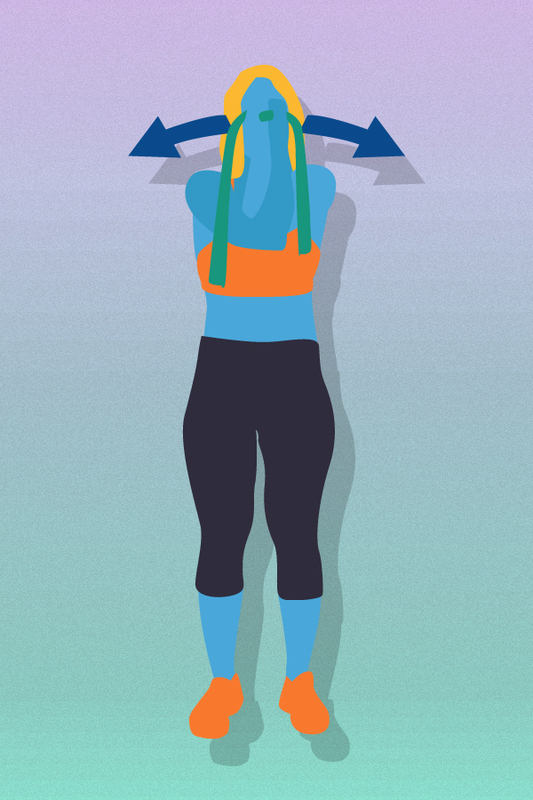 Draw your elbows and shoulders straight back as if you were trying to have your elbows meet behind you. Slowly release your arms forward, keeping the repetitions smooth, continuous and controlled. For this one, Camper says to place one end of the band under each of your feet and hold the other end with both hands. Do a squat. 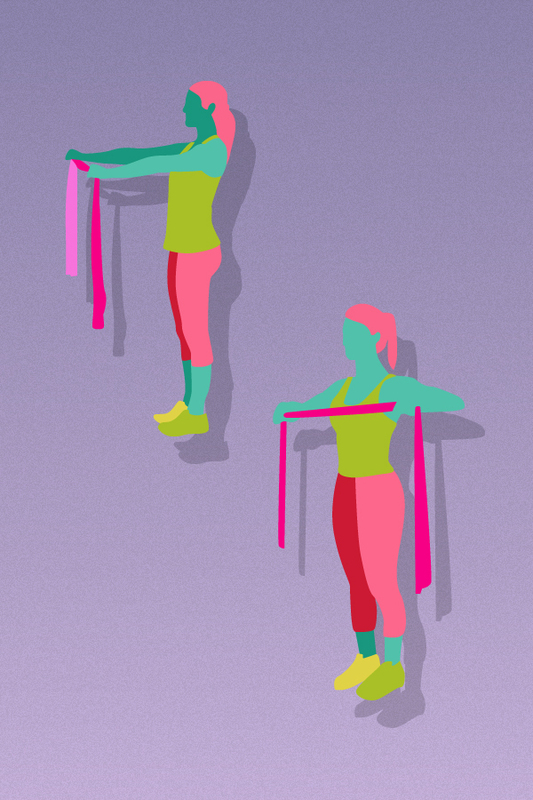 Then, at the top of your squat, do a shoulder press going up with the bands extending above your head. To stretch the back of your arm, Webb says to hold one end of the band against your chest with your left palm. Hold the other end of the band in a right fist grip with your palm down. Keep your elbows close to your sides and your left hand in position. Press the palm of your right hand down toward the floor. Slowly release your right arm back up to waist level. Press down, then release up, keeping the repetitions smooth, continuous and controlled. Don’t let the band snap up. To stretch the front of your arm, Webb suggests holding the band in two fist grips with your right palm up and left palm down. Position your left fist in front of your right hip and your right fist directly above your left fist. Keep your elbows close to your sides and your left hand in position. 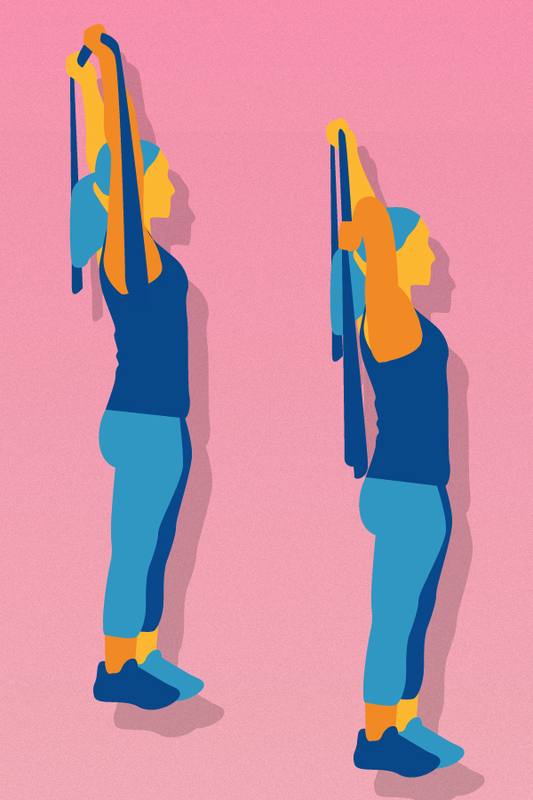 Curl your right fist toward your right shoulder and slowly release it down to the point before the band goes slack. Curl up and release down, keeping the repetitions smooth, continuous and controlled.